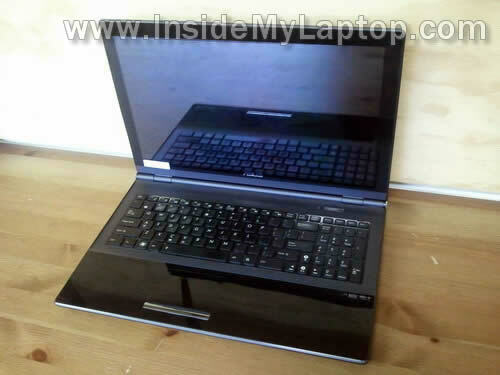 In this guide I will disassemble an Asus UX50V laptop. I’m not sure 100% but I think this guide might work for one of the following Asus models: U50A, U50F, U50VG, U50, U50V, U50F, U50VF. If you have one of the mentioned models please confirm if my guide works (of doesn’t work) for you in comments after this post. ШАГ 19-21: Removing the motherboard and accessing both memory modules. Turn off the computer. Remove the battery. 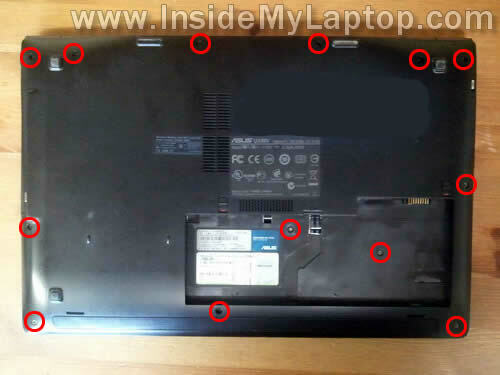 The keyboard is secured to the top cover by five plastic latches. 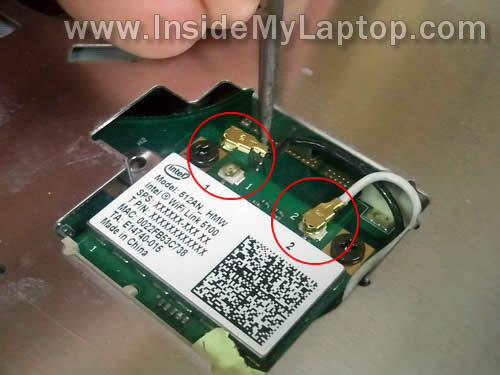 Push on a latch with a small flathead screwdriver and at the same time lift up the keyboard a little bit. 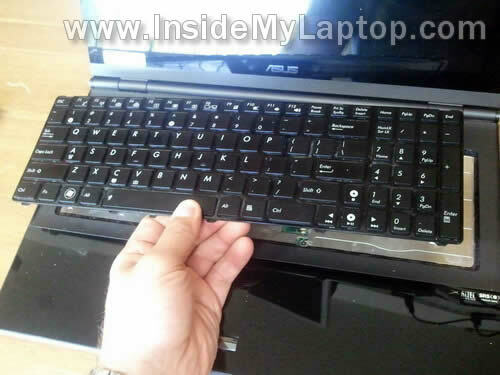 When the keyboard is lifted up, it will not allow the latch to lock. 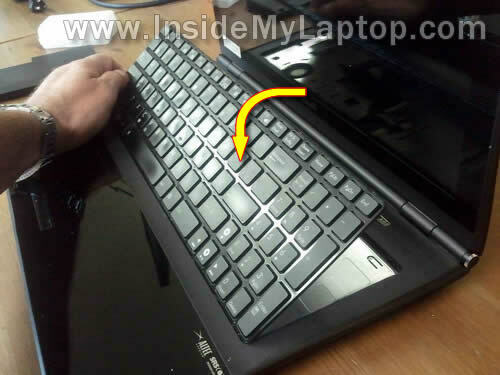 Now you should be able to lift up the upper side of the keyboard and turn it upside down. 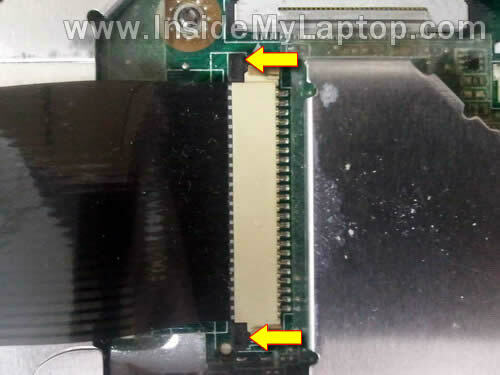 Be careful, there are two ribbon cables connected the keyboard to the motherboard. 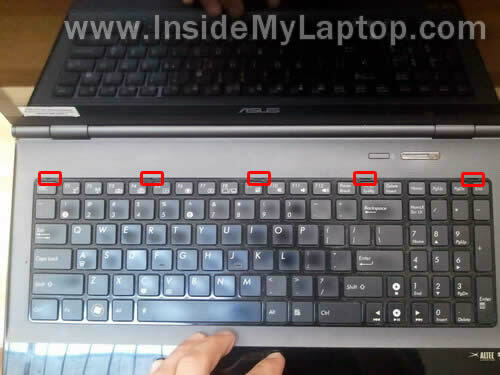 It’s necessary to unlock both connectors and release cables before removing the keyboard. In the following three steps I explain how to unlock connectors. 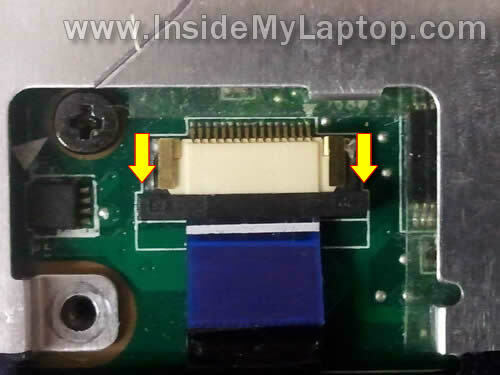 Here’s the main keyboard cable connector and it’s shown in the locked position. Slide the locking tab (brown piece) about 1-2 millimeters to the shown direction. 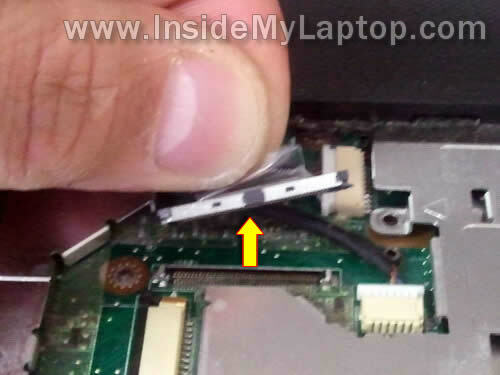 NOTE: the locking tab must stay attached to the connector base. 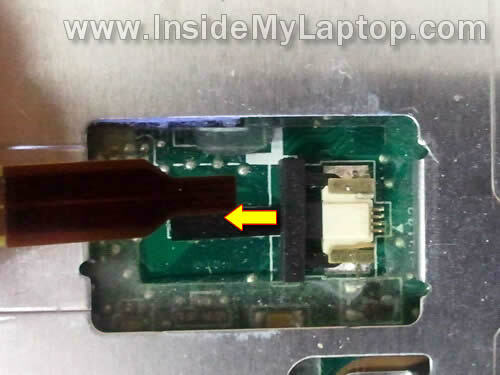 Unlock the keyboard backlight cable connector same way as the main connector. Release and remove the cable. Если на клавиатуре ноутбука не работают клавиши, то с вероятносью 99% клавиатуру надо будет менять на новую, чистка клавиатуры как правило не помогает. Приобрести клавиатуру к ноутбуку и установить можно самостоятельно. Например, клавиатура к Asus UX50V с доставкой обойдётся совсем недорого. Обязательно заказывайте клавиатуру с клавишами для своего языка. Also, it’s necessary to disconnect wireless card antenna cables from the wireless card. 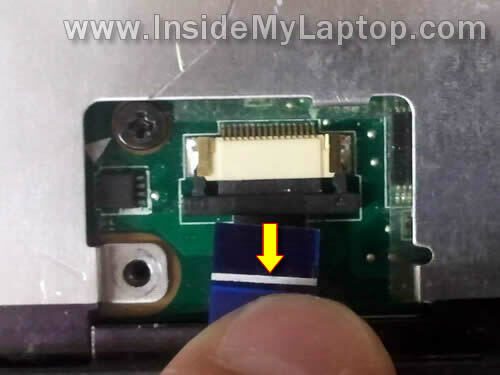 Here’s how to disconnect wireless card antenna cables. Simply lift up the golden connector and unplug it from the card. 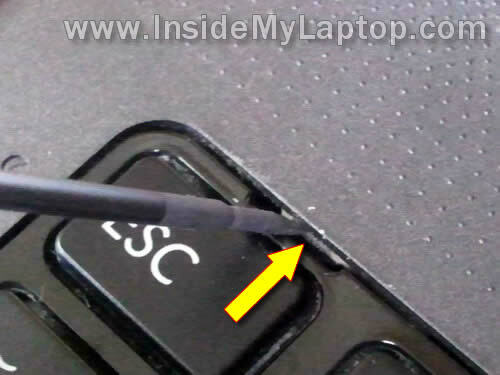 Disconnect the touchpad cable the same way we disconnected the keyboard cable in steps 4 and 5. 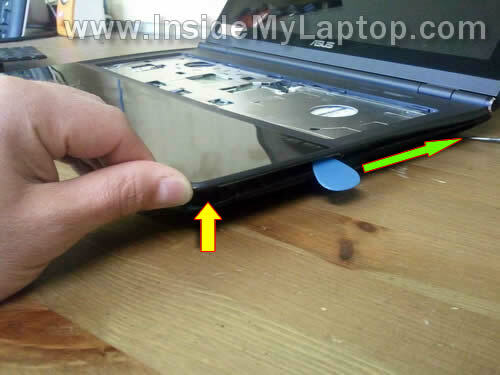 Slide the locking tab about 1-2 millimeters to the shown direction. After that pull the cable from the connector. 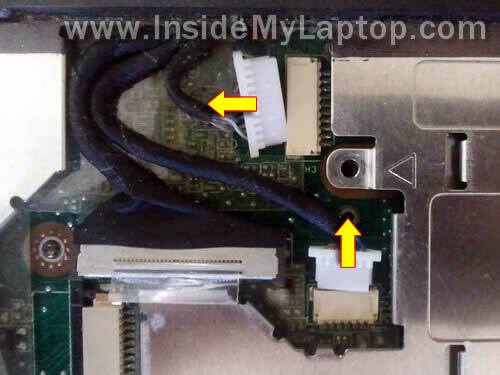 In order to disconnect the video cable, just pull it up by the clear tab attached to the connector. Finally, disconnect the web camera cable and power button board cable. These are regular male-female connectors. After all screws removed and cables disconnected you can start separating the top cover assembly from the bottom cover. I’m using the guitar pick as a case cracker. You can use a small piece of soft plastic. Insert it between the top cover and bottom cover and move slowly along the side. At the same time lift up the top cover with your finger. As you see, the display panel attached to the top cover. Remove them together. This is a view on the bottom part of the top cover assembly. 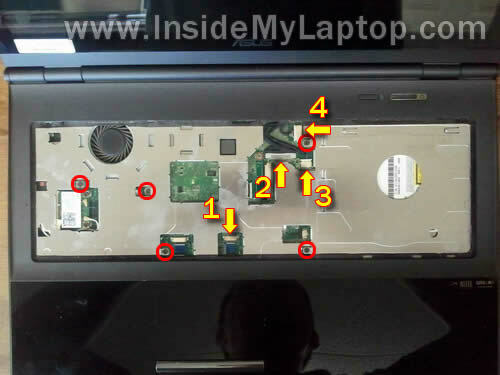 Here you can access the power button board and touchpad. 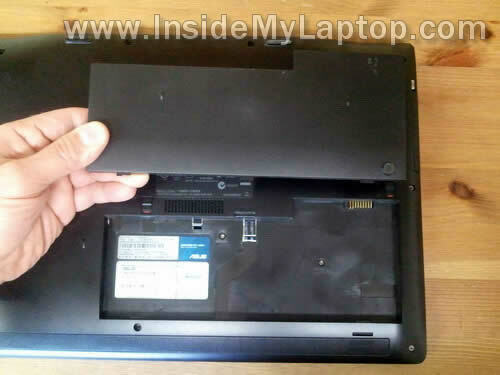 This is a view on the laptop internal components after the top cover/display assembly removed. 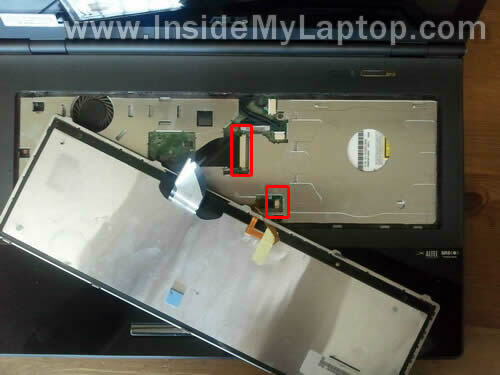 Remove four screws securing the DVD drive. 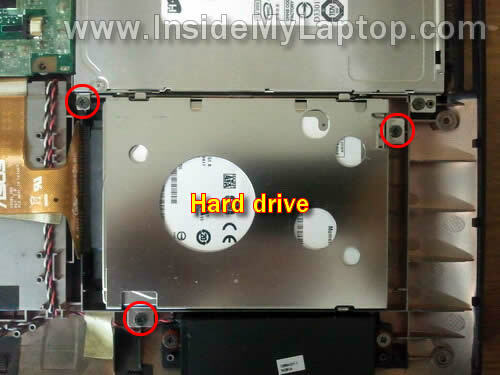 Lift up one side of the DVD drive and slide it to the shown direction to disconnect from the motherboard. 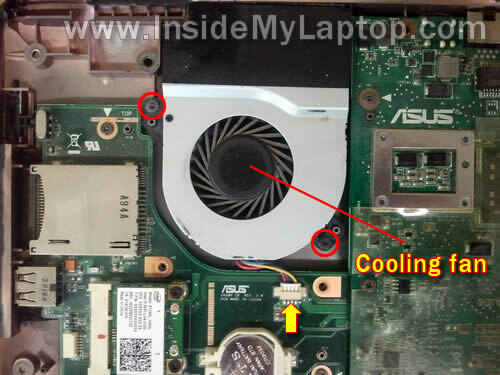 Remove two screw securing the cooling fan. Если вентилятор ноутбука шумит, гудит или совсем не вращается, можно провести его профилактику (почистить и смазать), но данная процедура не гарантирует долгой работы кулера в будущем. Лучшим вариантом будет его замена на новый, приобрести вентилятор (кулер) к Asus UX50V и установить можно самостоятельно. Remove screws securing the motherboard. 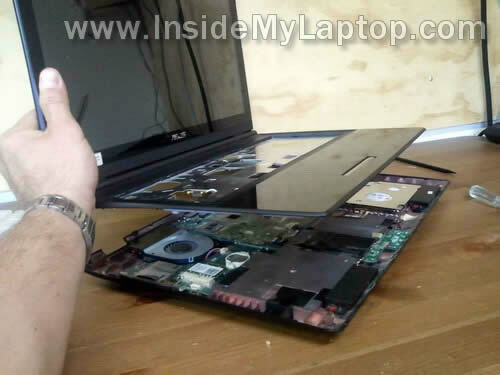 Carefully lift up one side of the motherboard and remove it from the bottom base. Here’s a view on the bottom side of the motherboard. 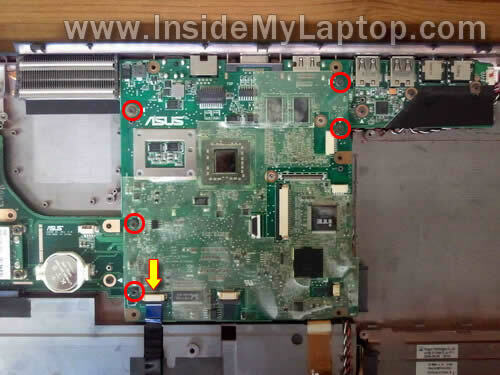 NOTE: in an Asus UX50V laptop both memory modules are located on the BOTTOM side of the motherboard. 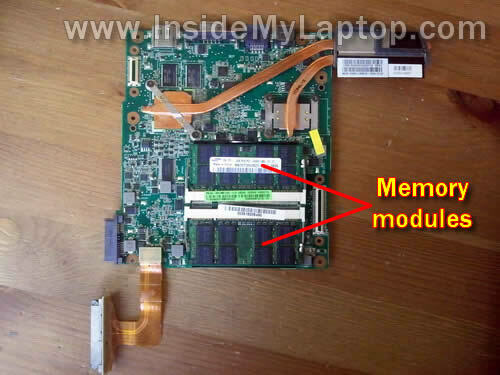 In order to remove, replace or upgrade memory it’s necessary to disassemble the entire laptop and remove the motherboard. Here’s a view on the bottom cover with the motherboard removed.